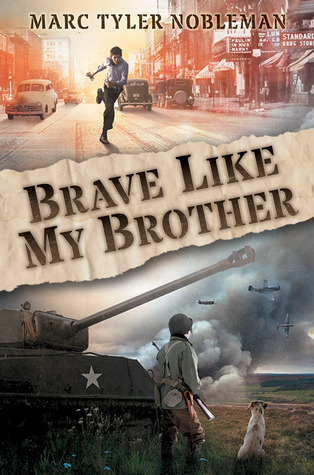 When Charlie's older brother Joe goes off to fight in World War II, he sneaks a letter into Joe's bag. When Joe gets it, he starts to write back, telling Charlie about his experiences in being sent to England to prepare for fighting. There's mud, there's rain, and there's Matt. Matt has a chip on his shoulders because he is from a harsh midwestern rural community, and believes that "city slickers" aren't prepared to fight. Joe is from Cleveland, home of the creators of Superman, and resents Matt's implications. Charlie is apparently having trouble of his own with neighbor bullies, and Charlie gives him as much advice as he can. Charlie is sent to France, but unlike so many US soldiers, manages to come back home to his brother. Sounds great! I'm looking for stuff for younger readers. And the obsession with WWII starts for boys when we recognize our first word on the page. Realistically, it's probably around 3rd or 4th grade. It certainly was for my group. And why is it WWII, not WWI or Vietnam? The Civil War and the Revolution hold some fascination for guys but not like WWII.